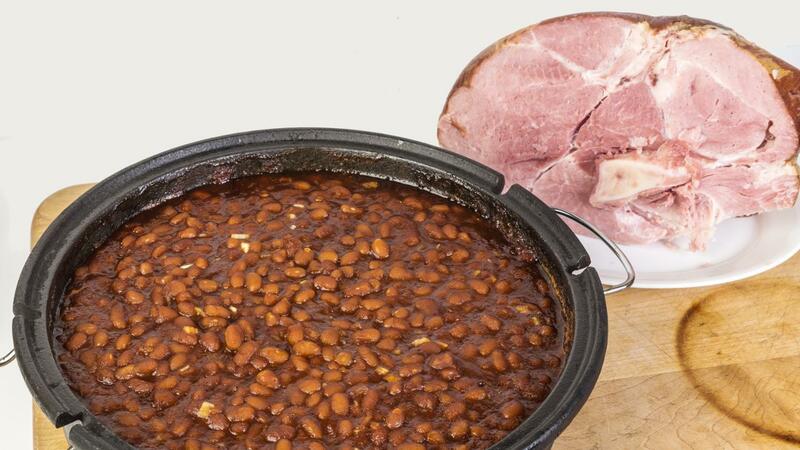 What Is a Recipe for Ham and Navy Beans in a Crock-Pot? Make ham and navy beans in a slow cooker by combining cooked ham, navy beans, carrots, onion and celery together with water or chicken broth in the slow cooker. Cook on low for 10 to 12 hours or until the beans are tender. Add fresh parsley just before serving. Cut 1 pound of cooked ham into bite-sized cubes. Place the ham into the slow cooker with 2 cups of water, 1/4 teaspoon of dried thyme and 1 teaspoon of liquid smoke. Add 1 cup of sliced celery, 1/4 cup of chopped onion and 1 cup of sliced carrots. Sort and rinse 1 cup of navy beans before adding them to the slow cooker. Cover and cook on low for 10 to 12 hours or until the beans are cooked and tender. Stir in 1/4 cup of chopped fresh parsley immediately before serving. Another recipe calls for soaking the navy beans in water for up to eight hours prior to cooking. Drain the water, and replace it with fresh water to cover the beans. Add 2 peeled and diced potatoes to the slow cooker along with 3 stalks of sliced celery and 3 peeled and shredded carrots. Peel and dice one onion, and add it to the slow cooker with 2 cups of cooked ham, cubed. Cover and cook on high for 3 1/2 hours. Reduce the temperature to low, and cook for an additional 6 1/2 hours. What Is a Good Crock-Pot Pea Soup Recipe? What Is a Simple Recipe for Crock-Pot Potato Soup? What Is a Recipe for Crock-Pot French Onion Soup? How Do You Make Ham Hocks With Navy Beans? What Is a Good Recipe for Crock-Pot Vegetable Soup? What Are Some Good Recipes for Crock-Pot Mashed Potatoes? What Is a Good Recipe for Mexican Tortilla Casserole?